Adorn your bed with a gorgeous personalised bedspread printed with your original photos. Made from double thick anti-pil polar fleece, it's an incredibly soft furnishing that provides you with extra warmth as well as a decorative feature for the bedroom. With the option to print on both sides, you can switch up the style day-to-day and change the aesthetic of your room. Make your own bedspread in four sizes and bring a touch to personality to your decor. Made from double thick anti-pil polar fleece, this sumptuous bedspread is a luxurious way to display your photos. 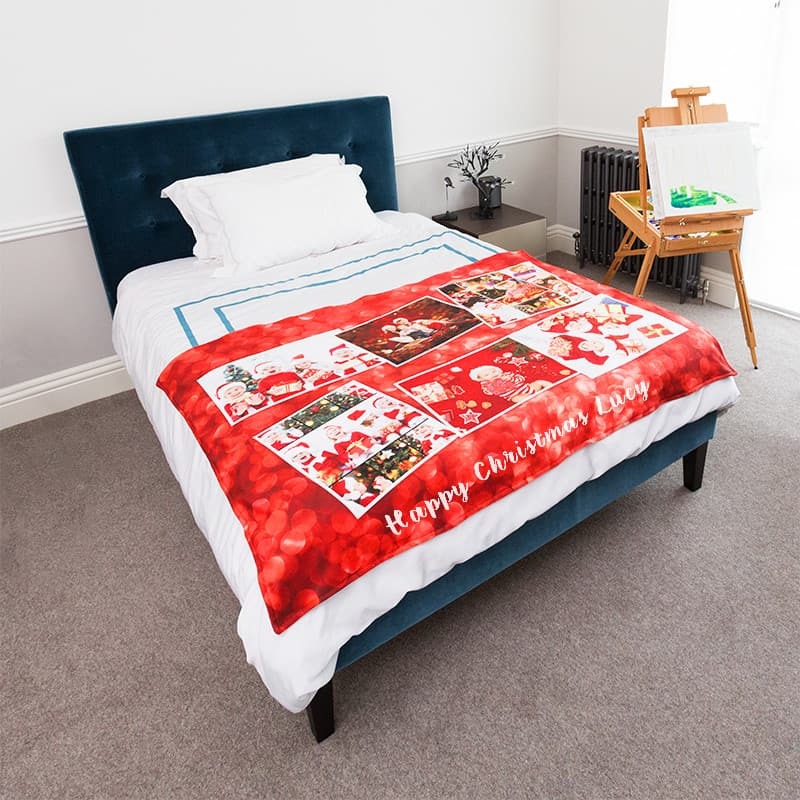 It comes in four sizes, perfectly suited to a range of different beds from children's to super king size, so you can kit out the whole family with a bedspread to suit their personality. Print on both sides so you can switch up the style, or choose single-sided printing and select from a soft pink, baby blue, black or cream backing. This is a gorgeous gift for anyone who loves a lie-in and wants to curl up surrounded by fond memories. I originally wanted a larger blanket but was alerted my photo quality may not be good enough - thought this was good as don't want to spend lots on something which would be poor quality. The product arrived quickly and as advertised. This was a gift for my Mum who is delighted with it. I bought this blanket as a present for my mum. I was so happy with the quality and the print. Definitely worth the money and would recommend this product. The product was well made and as a gift delighted the person who got it. Design three personalised bedspreads for the price of two. Each one can be designed individually to feature a different photo, simply make sure there's three in your basket and the discount will automatically be applied. Made by hand with love, care and expertise, your photo bedspread is a beautiful gift for a loved one. We take two layers of 285gsm polar fleece and stitch them together, resulting in a double thick, double warm, double soft piece of bedding. Your designs are printed directly into the surface, where the inks fuse with the fibres guaranteeing a long lasting, high definition print. The reverse layer is either printed with more of your photos or your choice of four colours. With a luxurious, soft handle and a flawless finish, it's a truly bespoke addition to any bedroom. There are four sizes to choose from, but each size comes in either portrait or landscape orientation, allowing you to customise according to your specific designs. If you have a panorama photo from holiday, the landscape bedspreads are more suitable, whereas the portrait options are better for full-length photos. Also, double-sided printing gives you the opportunity to essentially get two in one. Print completely contrasting designs on each side so you can transform the look and feel of the room in an instant. You could have photos on one side and an abstract graphic on the back, or surprise your recipient with a special message on the back. Make your own bedspread to bring comfort to a friend or relative receiving home care. As they undergo treatment, this gift printed with happy memories is a nice way to wake up in the morning. Choose a special holiday or memorable occasion and upload the photos onto this gorgeous gift. If you're passionate about interior design, design your own bedspread featuring a gorgeous painting, illustration or drawing. Who said art has to go on the walls? This will look especially good if the rest of your room is minimalist, leaving the bedspread to stand out and gain all the attention.